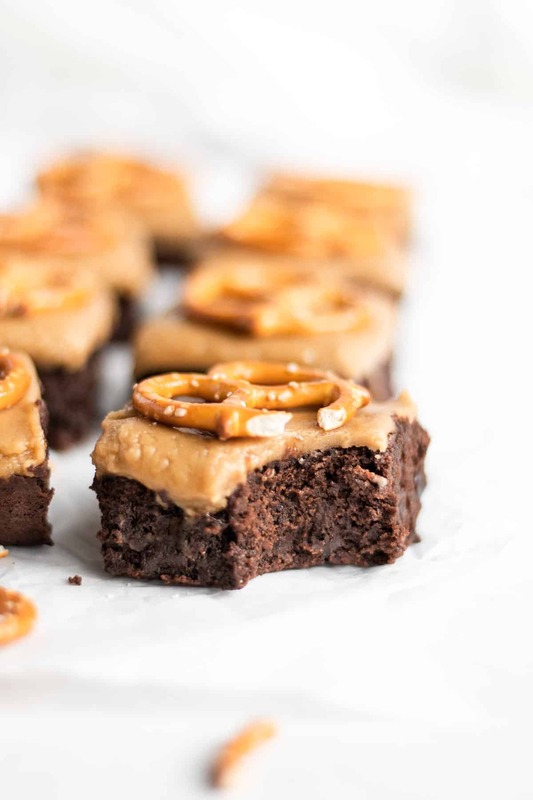 These Guinness brownies are topped with butterscotch fudge and garnished with a crunchy salted pretzel. Its official. The Giants versus the Patriots on February 5th. I’ve been trying really hard to understand and enjoy watching football. I have my dad, boyfriend, and a best friend that keep trying to explain to me the intricacies of the game. Don’t lose hope, one day I’ll get it. For now, its okay that I’m not fixated on the game. Someone, meaning me, has to be in charge of preparing the finger foods and bite sized desserts for people to enjoy on game day. Isn’t that a win-win situation? What’s sure to be at every Super Bowl party? Some beer, pretzels, and probably some brownies. 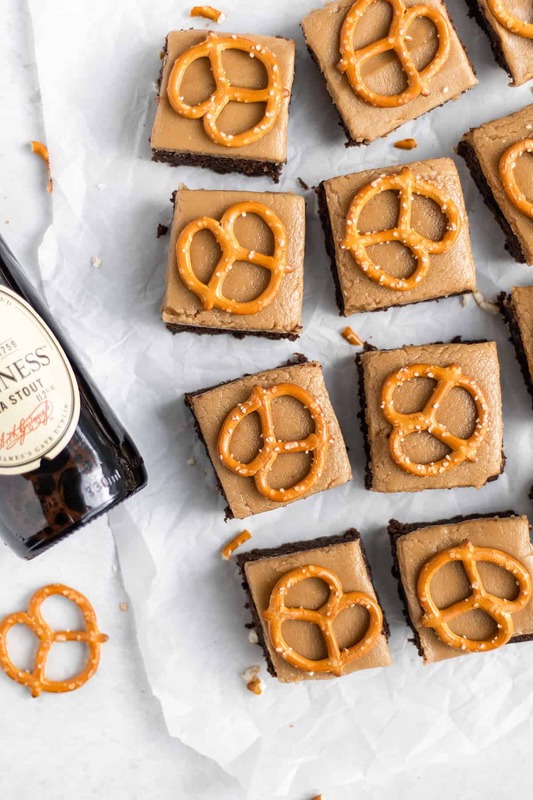 Mix it all together and you get my Guinness brownies with butterscotch fudge and salted pretzel. I would be more than happy to watch the 4th quarter with a couple of these brownies by my side. 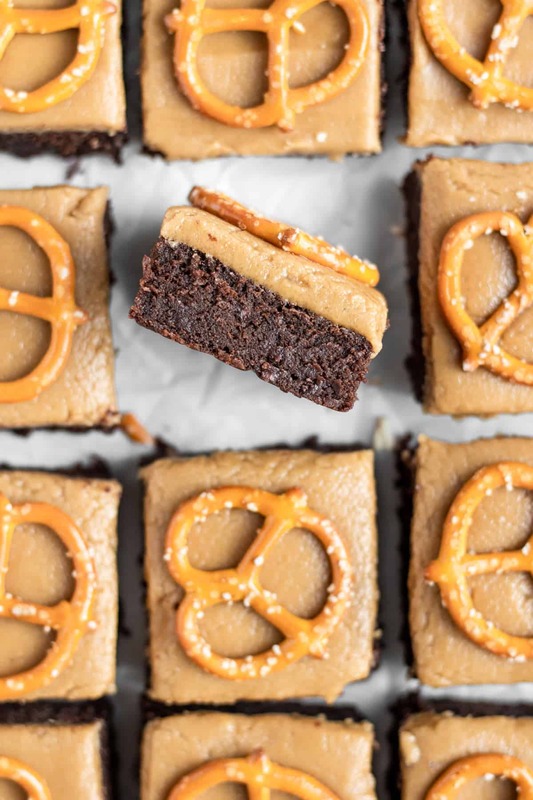 he secret to these brownies are the salted pretzels that keep you coming back for more. This recipe makes about 40 bite-sized pieces. That should be enough to hold you and your guests over until half-time. Preheat oven to 350 degrees F. Line sheet tray with parchment paper. Grease pan extenders and place above sheet tray. Or, use any 9'' x 13'' baking pan. In a large saucepan, melt butter and chocolate over medium-low heat. Once melted, add sugar and brown sugar. Stir to combine. Remove from heat. Transfer batter to the bowl of a stand mixer with a paddle attachment. Add eggs one at a time, making sure each egg is fully incorporated before adding the next. Whisk together flour, cocoa powder, and salt. Alternate adding dry mixture and Guinness to the batter. Starting and ending with the dry mixture. Fold in chocolate chips. Pour into prepared pan. Bake for 25-30 minutes until toothpick inserted in the center of the brownie comes out clean. Let cool on rack. In a medium sauce pan, melted butter and brown sugar. Heat over medium heat until sugar mixture starts to boil. Let simmer for a 1-2 minutes. Then remove from heat. Add salt. In the bowl of a stand mixer with a paddle attachment, mix confectioners sugar, cream and vanilla. Once mixture is paste like, slowly add the slightly cooled butter-sugar mix. Beat at low-medium speed until thoroughly combined. Immediately pour over cooled brownies and level with an offset spatula. 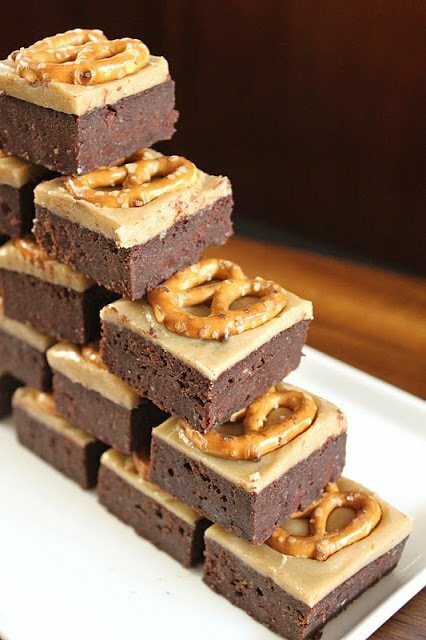 If desired, place pretzels on top of fudge. Let fudge set before cutting. Serve same day. Pretzels will get stale overtime. If the brownies are going to sit out awhile, I suggest chocolate covered pretzels. These brownies look amazing! Love the pretzels on top and the fact that Guinness is in there. Very creative. I always find delicious things on your site, so not sure why I am not already a follower but I am now. Have a great day! Whoa…what an amazing combo! Brownies and butterscotch as separate entities are fantastic enough. Together, they must be heaven. I love the little pretzel topper! I spread a thin layer of butterscotch on the brownies and saved the rest for myself! ;) Next time I make these I’ll have to use chocolate dipped pretzels because the pretzels get stale pretty quick. I love this idea–and I love pretzels with sweets and chocolate! Can’t wait to try these bars. These look amazing! And I love your photography. GO GIANTS!!!!! Love the pretzels on top! Makes the sweet treats more delightful to my tastebuds, since there is that mild salty flavor to break the flavor. What a perfect way to enjoy game night. Lovely post! Thank you! Yeah, its pretty amazing how adding a little bit of salt can make the dessert taste so much better. I just made the Homer Simpson drool noise in my head when I saw this photo. PERFECT for those of us hosting a bunch of loud boys for the superbowl next week! Nom nom nom! I love The Simpsons. I’ve always wanted to make that donut with the sprinkles and pink glaze. Have fun with the boys next Sunday! Um…wow. Guinness is good, butterscotch is amazing, pretzels are my favorite snack but combining them all together??? Pure Genius! How did you cut them so perfectly? I used a really sharp 9 inch chef’s knife. Get the sharp point on one end of the brownies then cut down. Don’t drag the knife, just let it chop through the brownies then bring it back up. Wipe it clean and cut again. These look delish! I’m sure they were more fun to make than understanding the rules of football! Our food lovers would LOVE this. We’d love if you’d check it out and contribute! http://bit.ly/yI0sZU Cheers! What kind of dark chocolate? Semi-sweet? Bittersweet? Unsweetened? LOVE this – I’m tweaking a bit for my superbowl party – Making a maple fudge for the top (with a bit of maple extract) and topping with candied bacon instead of a pretzel. Am using Young’s Double Chocolate stout in lieu of Guinness. Found this recipe through Pinterest, and thought it would be great for St. Patty’s Day. I just made them, and they are fantastic! I added a little drizzle of green-dyed white chocolate on the pretzels to be festive. I love that stout, chocolatey flavor with that butterscotch and salty pretzel. Thanks for sharing! What if only large eggs? Ok or need to add something, or a 4th egg? I think you’ll be fine with three large eggs. If you’re worried, you can do three large eggs and then whisk a fourth egg in a separate bowl and use half of it. I think using four large eggs might be a little too much. Thanks I just took them out of the oven, look awesome! Will let you know how they taste. I added some butterscotch schnapps and replaced half of heavy cream with baileys – couldn’t resist the extra booze for st pattys! Does it say the cooking time anywhere? I read thru the comments AFTER I made these. I wrongly assumed you meant bakers chocolate and used unsweetened. I gotta tell you, I can not imagine these with sweetened chocolate. They are plenty sweet with the cup of sugars and the mini choc chips. Give it a try. I used a local brewery coffee stout (Ellison Tiramisu Coffee Stout)…holy cow did it turn out great! !